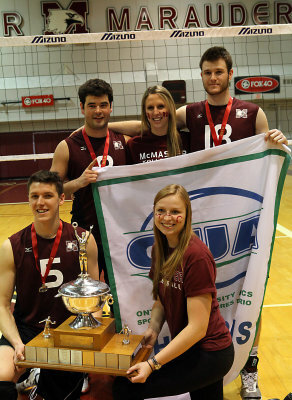 Congratulations to DA alumni who playing for McMaster this past weekend won the Mens OUA Championship. Fixtures on the Mac starting lineup are DA alumni in setter Austin Campion-Smith, Middle Alex Elliott, and right side Jayson McCarthy. Austin was player of the game for the OUA final. Congrats guys! Landis Doyle Named CCAA and OCAA Female Athlete of the Year! Landis Doyle, a Durham Attack alumni, has been named the Canadian Colleges Athletic Association (CCAA) and Ontario Colleges Athletic Association (OCAA) Female Athlete of the Year, across all sports. She becomes the first athlete, male or female, from an Ontario Colleges Athletic Association (OCAA) school to ever receive such an honor from the CCAA. According to the OCAA ” Doyle… rewrote the OCAA record book in her final season with the Hawks. The graphic design student set the all-time OCAA points record in 2010-11 with 1,120 points, 85 more than previous record holder Megan Stacey of Nipissing. Doyle also established the new OCAA standard in career aces with 194. Doyle finishes her OCAA career in second place in all-time kills (778) and stuff blocks (148). During the 2010-11 season, Doyle led Humber to a fourth straight OCAA championship. She led the OCAA with 312 points and 246 kills as the Hawks finished with a 21-1 regular season record en route to an OCAA four-peat. Congratulations to Landis for winning yet another accolade – Canadian College Athletic Association female volleyball player of the year! I remember the day… when our senior teams produced their own slide shows/videos. I have this one from about five years ago… and in it you will find some of our alumni who have gone on to very successful careers. Landis Doyle, who just broke the OCAA all-time scoring record; Kaila Jansen who with McMaster is 14-1 so far this season; Haley Todd and Annabelle Pellerin at Syracuse; coaches Hoi Leung, Robert Chung, Glenn Imperial and Tine Lee, and others. 2006 Durham Attack 18U Girls Video.